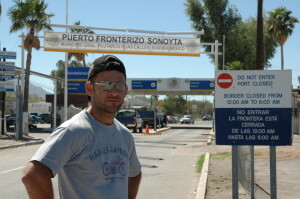 KT reporting from the US-Mexico border in Arizona. 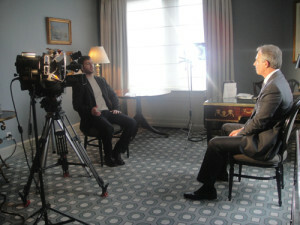 KT interviewing UK Prime Minister Tony Blair. KT was born in 1973 to a stay-at-home mom and a dad who worked as a lineman. His paternal grandfather was a carpenter, and his maternal grandfather a butcher. He’s a third generation working-class Italian-American, with roots in New York City, where he currently manages an apartment building purchased by his great grandfather for $13,000 earned working as an auto mechanic. KT’s dad was one of the early Italian-American pioneers to settle in South Florida during the late 1970’s. KT grew up there fishing, hunting, and helping his dad restore classic cars. He worked as a stock man for Publix supermarkets all through high school, and for the Lake Worth Drainage District afterwards. He later became the first person in his family to go to college. KT and his wife, Jin have lived in Plymouth Vermont going on four years now. They moved to Vermont in search of a place where neighbors knew each other, and community flourished. They had their first child, son Eugene, in May 2015. KT has also lived and worked in Italy, the Balkans, Germany, and traveled extensively throughout the U.S. He holds an advanced degree in international development economics from The Johns Hopkins School of Advanced International Studies. He earned his Bachelors in Political Science and Economics from the University of Florida. In Washington, DC, KT worked for the U.S. Department of State as an assistant Press Officer, and as a producer for ARD German Television, the largest broadcaster in Europe. He led and coordinated teams at natural disasters, fires, shootings, protests, and the 2004 & 2008 Presidential elections. He produced three documentaries spanning several states, including Montana, Kentucky, West Virginia, Louisiana, Kansas, California, New York, and Washington, DC. Several of the pieces he produced gained record market share, and two were nominated for awards. Prior to ARD, KT produced for Fox Television on the show America’s Most Wanted. In September and October 2005, KT spent a very long two months sleeping in his car in Louisiana, Mississippi, and Texas while covering Hurricanes Katrina and Rita. The State of Vermont is a State unique among the 50 United States of America, with its own rural sensibilities, and a culture forged hard work, frugality, and an innate aversion to tyranny. Don’t let the morally bankrupt and soft-brained thinking dominating the national conversation to forever transform Vermont. What’s happening in Vermont is happening in States all across the US: slowing or nonexistent economic growth combined with the fallout from 2009’s “Great Recession” have reduced tax revenues, while state budgets have continued to balloon. The logic here is simple: you cannot spend money you do not have. The only path to a better future involves making tough decisions about reducing spending, cutting taxes, and bringing back real working class jobs anchored by industry. 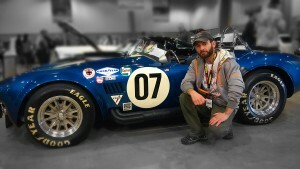 KT with an original Shelby Cobra.